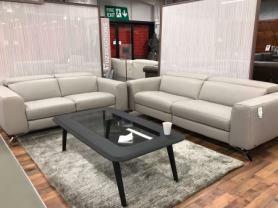 Bolzano beautiful soft grey leather 3 seater with 2 power recliners. Off the floor trendy design. Pocket sprung seats which are extremly comfortable and also high back for your back support. Approximate Measurements: 3 Seater: 223 cm. 2 Seater: 162 cm. Depth: 100 cm.